Climate outlooks provide probability-based information about expected rainfall and temperatures at timescales of months or longer. 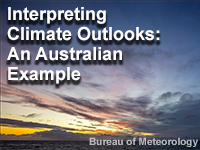 This lesson demonstrates how monthly and seasonal outlooks issued by the Australian Bureau of Meteorology can be combined with other information for use in decision-making by persons in climate-sensitive sectors. The lesson explains the main drivers affecting Australia's climate—ENSO, Indian Ocean Dipole, Southern Annular Mode, and the subtropical ridge—and explores how the status of the climate drivers can affect the outlook maps as well as confidence in the outlook information. Case examples (for Wagga Wagga in eastern Australia and Merredin in western Australia) provide a context for interpreting the different types of outlooks using past accuracy maps, climate driver information, and antecedent conditions to arrive at a decision based on the projections and overall confidence. They really want us to understand how to use their products. By introducing concepts and revisiting them throughout the lesson, it makes it easy to understand. Enjoyed the videos that accompanied this module. It has been a great lesson which teachs about the tools available to predict the climate. Describe the main climate drivers and their influence on the Australian region. List the outlooks produced by the Australian Bureau of Meteorology. Identify relevant climate information for your decision. Interpret climate outlook maps for rainfall and temperature, with a stronger focus on rainfall. Use the climate outlook maps and the past accuracy maps to inform decisions faced by climate-sensitive industries.